Generate seamless orthoimage mosaic datasets stored as a file format such as TIFF or CRF. Generate digital terrain models (DTM) and digital surface models (DSM). Ortho mapping capability requires the ArcGIS Pro Advanced license. 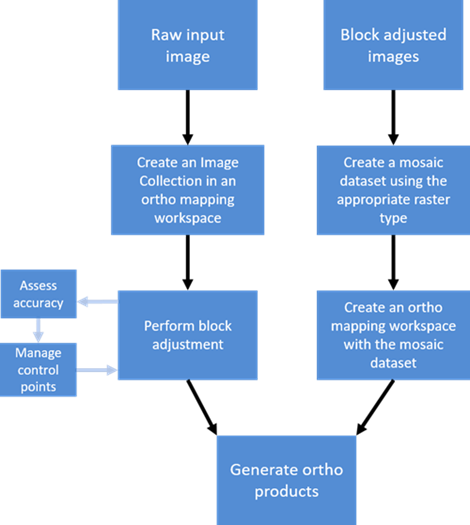 Create an ortho mapping workspace from your data. Perform block adjustment to correct the geometric distortions in the images. To get started, you will need to create a new project and then create an ortho mapping workspace, which is a subproject within the ArcGIS Pro project. The ortho mapping workspace manages all the ortho mapping resources and opens a map view with an Ortho Mapping tab and an ortho mapping view within the Contents pane for the ortho mapping workflow. The Ortho Mapping tab provides tools and wizards for bundle block adjustment and the generation of ortho mapping products. The ortho mapping view within the Contents pane manages and visualizes the layers of the related data in the ortho mapping workspace. Your ortho mapping workspace and the data stored within it will depend upon your source data. You can create an ortho mapping workspace for scanned aerial, digital aerial, satellite, or drone imagery. You can provide the ortho mapping wizard with a folder containing images or you can point to an existing mosaic dataset. When your ortho mapping workspace is created, an Ortho Mapping category is created in the Catalog pane. Expand this to see the ortho mapping workspace you created, with an Imagery folder containing your source imagery and a Products folder where your ortho mapping products will be stored. When your workspace is created, you will notice that the Contents pane contains a variety of layers associated with the workspace such as Control Points, Solution Points, and Data Products. These layers are empty until they are populated by initiating the proper steps in the ortho mapping workflow. For example, the Control Points layer is populated after performing block adjustment, and the Data Products are populated after performing ortho mapping product generation steps. The next ortho mapping step is to perform block adjustment using the tools in the Adjust and Refine groups. A block adjustment is a technique used in photogrammetry where an adjustment or transformation is computed for an area of project (a block) based on the photogrammetric relationship between overlap images, ground control points (GCPs), a camera model, and elevation data. Tie points—minimize the misalignment between images as they tie overlapping images to each other using coincident image features derived using automatic image matching techniques. GCPs—georeference the images to the ground using ground reference data. GCPs are often collected using ground survey techniques, and these survey points need to be visible in the source imagery. Alternatively, secondary GCPs can be derived from an existing orthoimage base map. Triangulation—is used to compute the image-to-map projection transformation by minimizing and distributing the errors among images and control points. Applying a block adjustment is an important step in the orthorectification process, and the quality of the ortho mapping products depend on the accuracy of tie and ground control points used in the adjustment. Overlapping imagery is required, with best results produced with 30% overlap or more. If the project area is affected by elevation changes or rough terrain, a high accuracy digital elevation model (DEM) with a post spacing sufficient to accommodate the breaks in terrain will be necessary for good results. The block adjustment tools are found in the Adjust and Refine groups on the Ortho Mapping tab. You can modify the Adjustment Options, run a Quick Adjustment for drone or scanned aerial imagery, or add GCPs and run the Adjust tool. To import, modify or delete GCPs, use the Manage GCPs tools. The control points, solution points, block adjustment results and other pertinent data are stored in the workspace for the project. This information is accessed by the relevant tools as you progress through the workflow to produce ortho mapping products. For example, the adjustment transform associated with each image is used when generating the orthomosaic output. To learn more about the block adjustment tools in the ortho mapping workspace, see the ortho mapping Block Adjustment. After performing an initial block adjustment, you can generate a summary report using the Adjustment Report tool. The report includes information about the solution points used in the adjustment, camera information, GPS deviations, and the amount of image overlap. If you used check points in your ortho mapping process, the report will provide the root mean square error (RMSE) for check points which can be used as a measure of absolute accuracy. Check points are conceptually the same as GCPs; they are points with known ground coordinates with links to visible features in multiple overlapping images, however, they are not used as inputs to control the adjustment process. Instead, check points measure the accuracy of the result. For each check point, the distance between its known ground location and the location of the corresponding pixel after the adjustment process is used to calculate the RMSE. You can change GCPs to check points using the GCP Manager pane, then perform a block adjustment and view the adjustment report. To refine your results, try adding or removing GCPs, changing different GCPs to check points, or modifying the Adjustment Options. 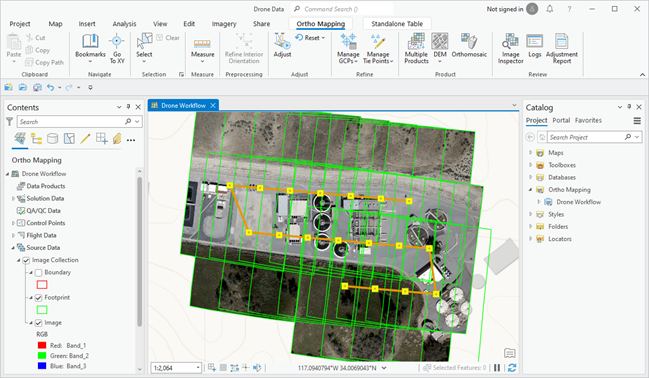 Once you have adjusted your imagery, you can generate a number of ortho mapping products using the tools in the Product group. You can create a DEM, Orthomosaic dataset, or a Custom product. Each tool launches a wizard that walks you through the process of creating terrain corrected image products that can be used in digital maps or shared as image services for dynamic processing. See Create an ortho mapping workspace for more information. DTM—digital elevation of the earth, not including the elevation of any objects on it. This is also referred to as bare earth elevation. The bare earth DTM dataset is used to produce the orthoimage and orthoimage mosaics. DSM—digital elevation of the earth, including the elevation of objects on it such as trees and buildings. It should not be used for image orthorectification unless the source imagery is nadir-looking with no building or feature lean, to produce true orthoimagery. The DEMs wizard guides you through the DEM generation process where you set the various parameters defining the DEM such as type, elevation post spacing, pixel size, filter size for eliminating above ground features, and other specifications. The DEM products are stored in the DEMs folder under the Ortho Mapping category in the Catalog pane. Use an existing DEM or a DTM generated via the DEMs wizard to create a photogrammetrically corrected orthoimage mosaic. The Orthomosaic wizard guides you through the workflow and allows you to set seamlines, sliver removal, and color balancing options for your orthomosaic. The output orthoimage or orthomosaic dataset is stored in the Orthos folder under the Ortho Mapping category in the Catalog pane. The Custom wizard guides you through the workflow to create all the ortho mapping products. You can create a single product or all products with the Custom wizard. All available products include DTM, DSM and a photogrammetrically corrected image or orthomosaic. You can adjust the parameters settings for each type of product. The DEM and orthomosaic generated are stored in the appropriate folders under the Ortho Mapping category in the Catalog pane.